Agriculture is the number one industry in Santa Barbara County. Unfortunately, agriculture is also a leading source of water pollution on the Central Coast. When rain or irrigation water washes over agricultural fields, salts, nutrients, sediment, heavy metals and pesticides are mobilized and transported to the nearest waterbody. Most waterbodies located in or near areas influenced by agriculture have unsafe levels of nitrates and pesticides and excessive turbidity. Agricultural discharges pose significant risks and costs to public health, drinking water supplies, aquatic life, and valuable water resources. Santa Barbara Channelkeeper is a lead advocate for more stringent regulations to reduce pollution from irrigated agricultural operations on the Central Coast. We participated actively as a stakeholder in the Agricultural Advisory Panel that developed the first regulatory program to control polluted agricultural runoff by the Central Coast Regional Water Quality Control Board in 2004. 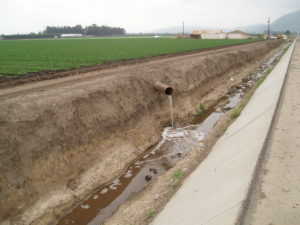 This program, commonly referred to as the “Ag Waiver,” expired in 2009, and the Regional Water Board convened another multi-stakeholder advisory panel then to guide the process, in which Channelkeeper again played a lead role. The process lasted for more than three years, during which Channelkeeper participated in numerous workshops, testified at hearings and submitted technical comments on a series of Regional Board proposals for a new Ag Waiver, which became progressively weaker thanks to intense pressure from the agricultural industry. Finally, the Regional Board adopted an updated Ag Waiver program in March 2012. While the new program is an improvement over the one it replaced and will likely result in improved water quality, many concessions were made to accommodate agricultural industry concerns. Despite these concessions and the new Waiver’s relatively weak requirements for the vast majority of the region’s farms, the agricultural industry petitioned the State Water Board to overrule and dismiss the new Waiver. To counterbalance this attack, Channelkeeper, along with Monterey Coastkeeper, San Luis Obispo Coastkeeper and the Environmental Defense Center, filed our own petition challenging the adequacy of the new Waiver to protect public health and the environment. After a preliminary hearing in August 2012, the State Board decided to delay or stay several provisions of the new Waiver while it fully considers both petitions, which could take a year or more. In addition to our advocacy on the Central Coast Ag Waiver, Channelkeeper is also working to address agricultural pollution by serving on the Carpinteria Integrated Pest Management Advisory Committee, advocating for strong controls on nutrient pollution from agricultural operations in the Ventura River watershed through the Los Angeles Regional Water Board’s Total Maximum Daily Load (TMDL) program to address excessive algae in the Ventura River, and through targeted watchdog monitoring to identify and eliminate illegal agricultural discharges.